In the UK we have a pretty solid idea of what we think a taxi looks like. It has four wheels, usually four doors and some sort of motorised engine. Different countries, however, have developed their own style of taxi that either once was or still is the most suited for their climate, cities and economy. What’s more, some taxi types have become so iconic that they have not only become synonymous with their host city, but a key part of its identity. 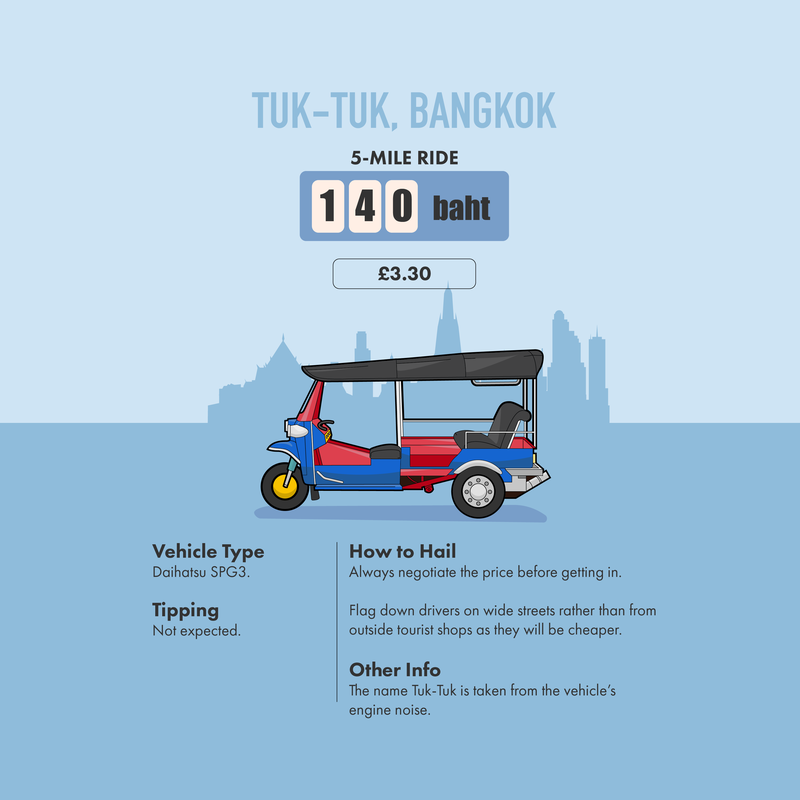 From the Bangkok tuk-tuk to the water taxis of Venice, each of these public hire vehicles has a different look, price and set of customs. 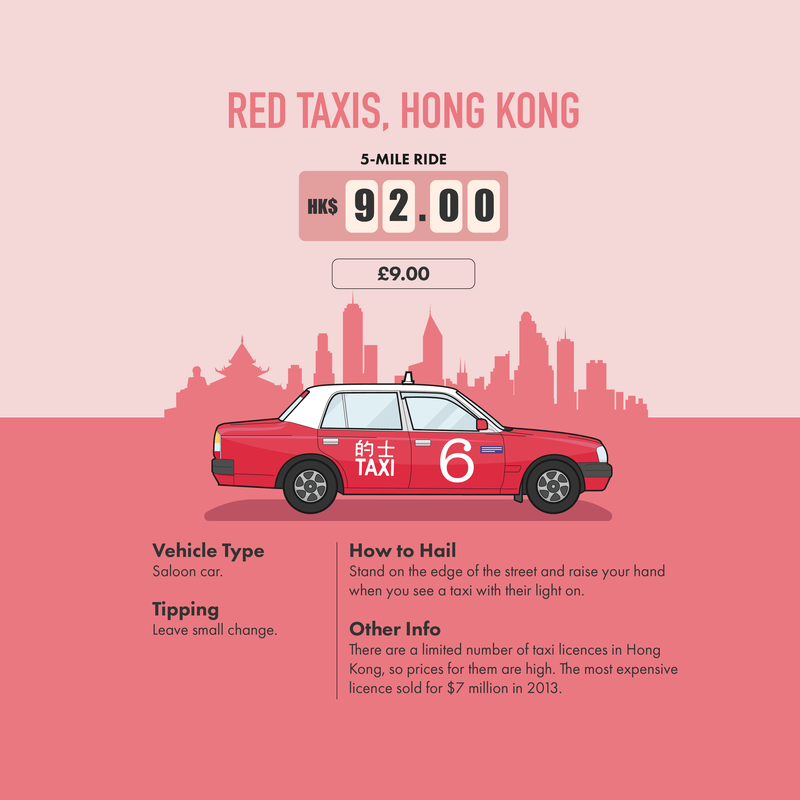 We’ve had a look at some of the most famous taxi types from around the world and worked out average prices, how much you should tip and some pointers on how to flag them down. 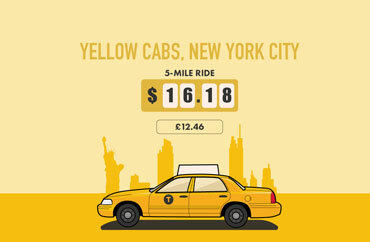 Taxi prices depend on the cost of living in that country. 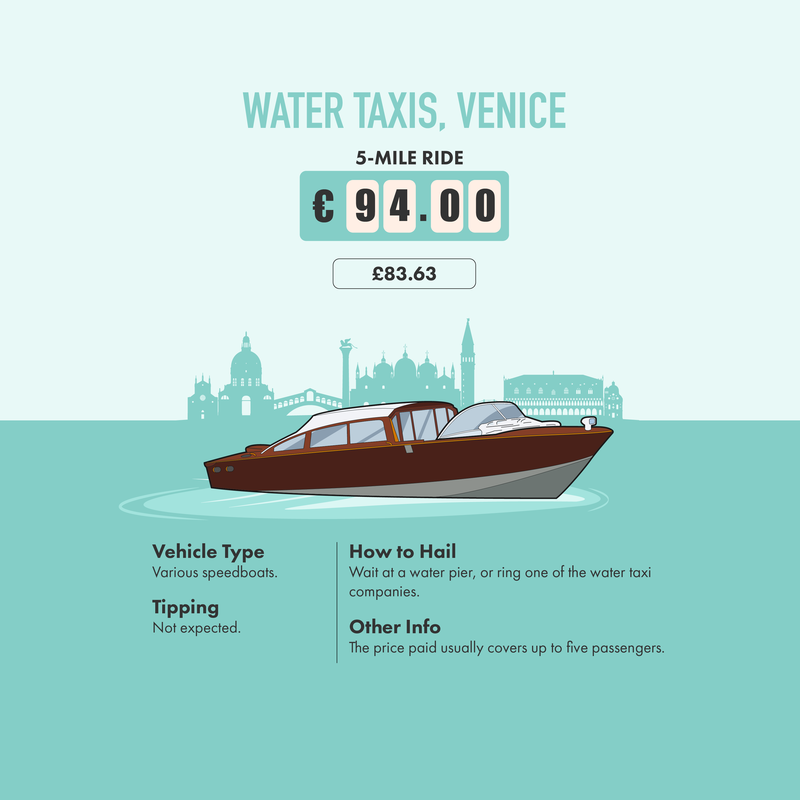 The most expensive is the water taxi in Venice, which will set you back around €92 (£82) for a five-mile journey. 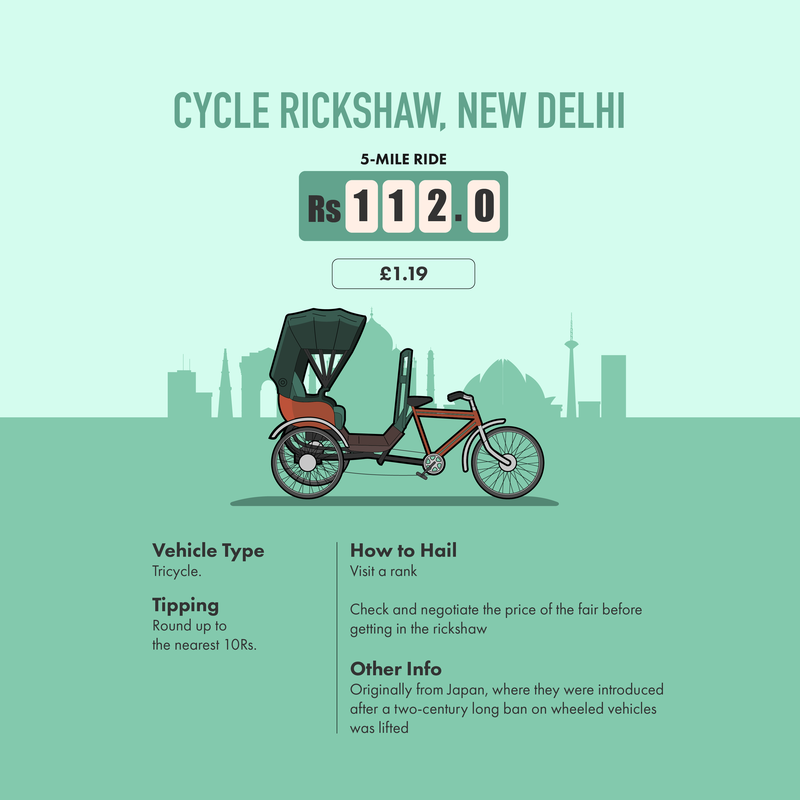 The same trip in a New Delhi cycle rickshaw, however, will only cost 113 rupees (£1.19). 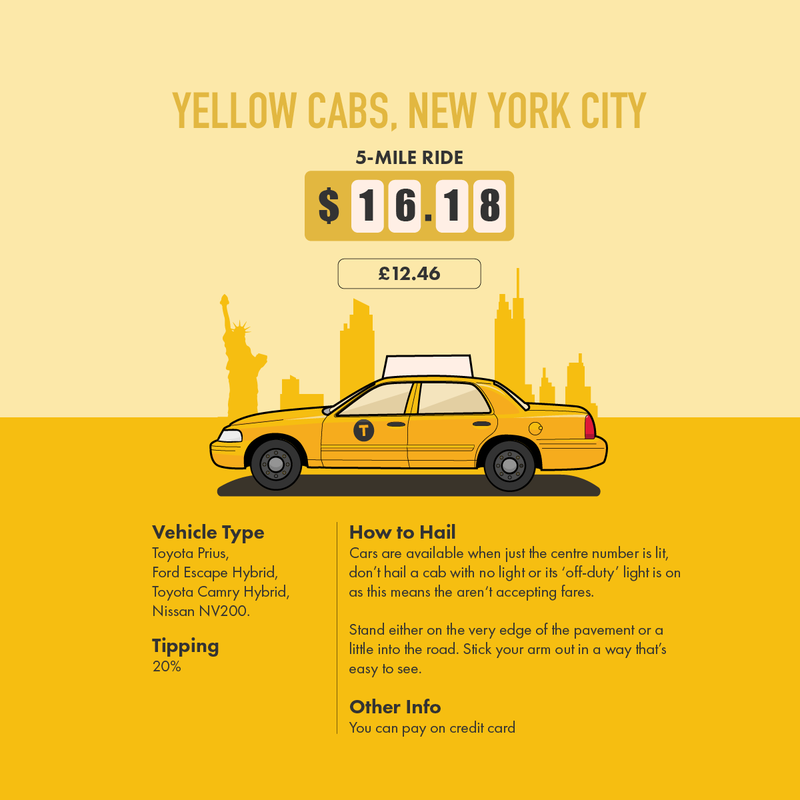 The huge variation in prices mean that the most expensive form of taxi we found will cost you 70 times more than the cheapest, for the same length trip. No matter what the taxi may look like, the basic principles of hailing a taxi remain similar worldwide. You can either head to a nearby taxi rank (or pier if you’re looking for a water taxi), or flag one down by standing on the edge of a road and putting your arm out. In some places, flagging down a taxi will get you a cheaper ride. 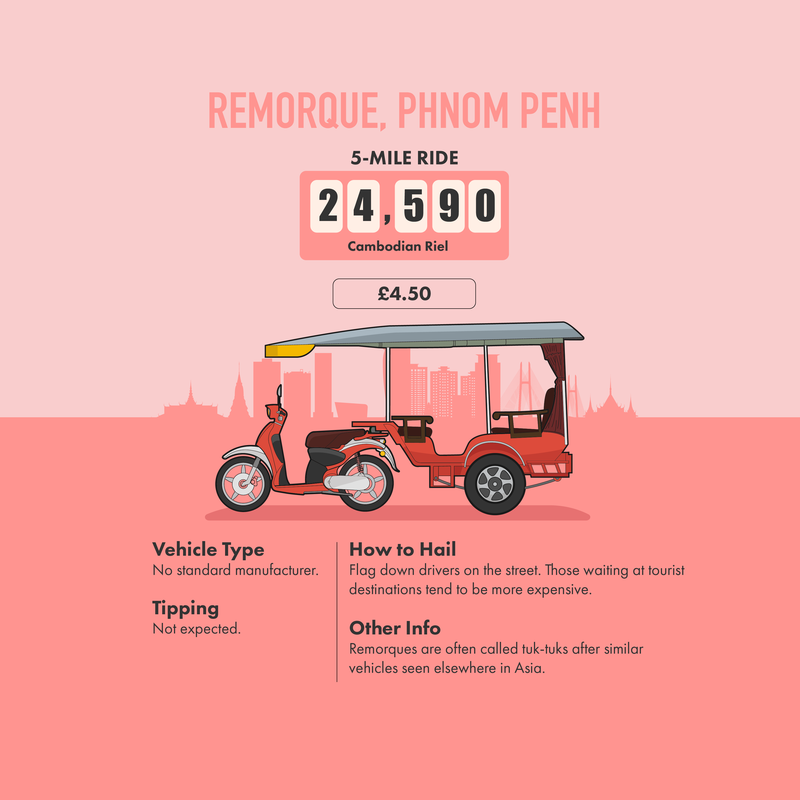 If you’re planning on using a remorque in Cambodia, avoid drivers waiting at ranks by popular tourist locations. Drivers waiting here tend to hike up prices. Instead, the suggested method would be to walk a short distance and flag down a vehicle. This should shave a bit off the price of your journey. When attempting to hail a taxi, spotting a vacant one can be challenging, especially in a busy city. The black cabs of London, yellow taxis of New York and red taxis of Hong Kong all have lights on top to let you know when they are available. When the lights are lit, they are available to take new fares. 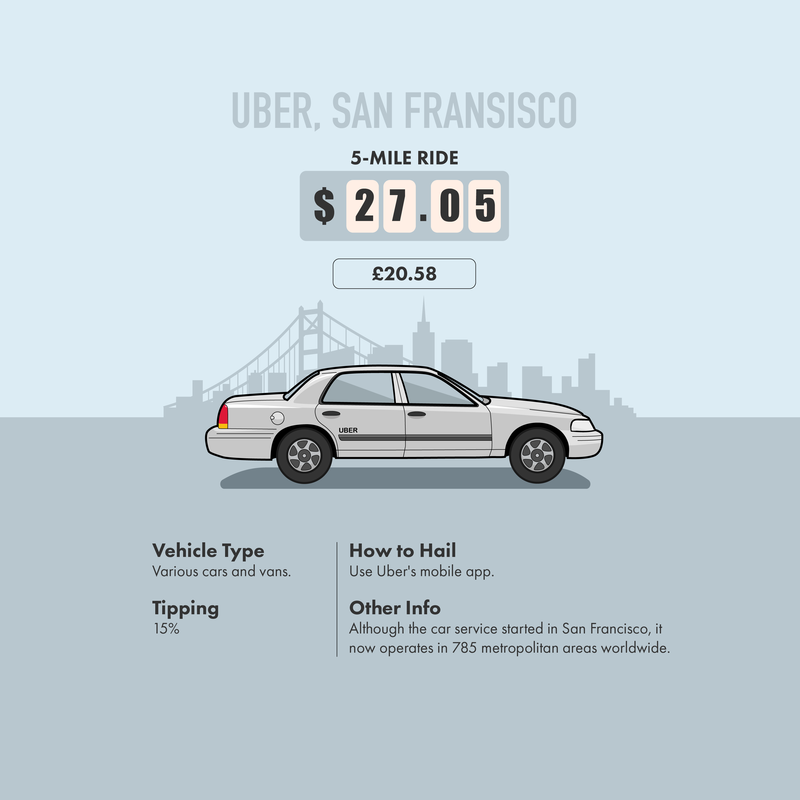 Often you can also get a cab by calling a company or using an app. 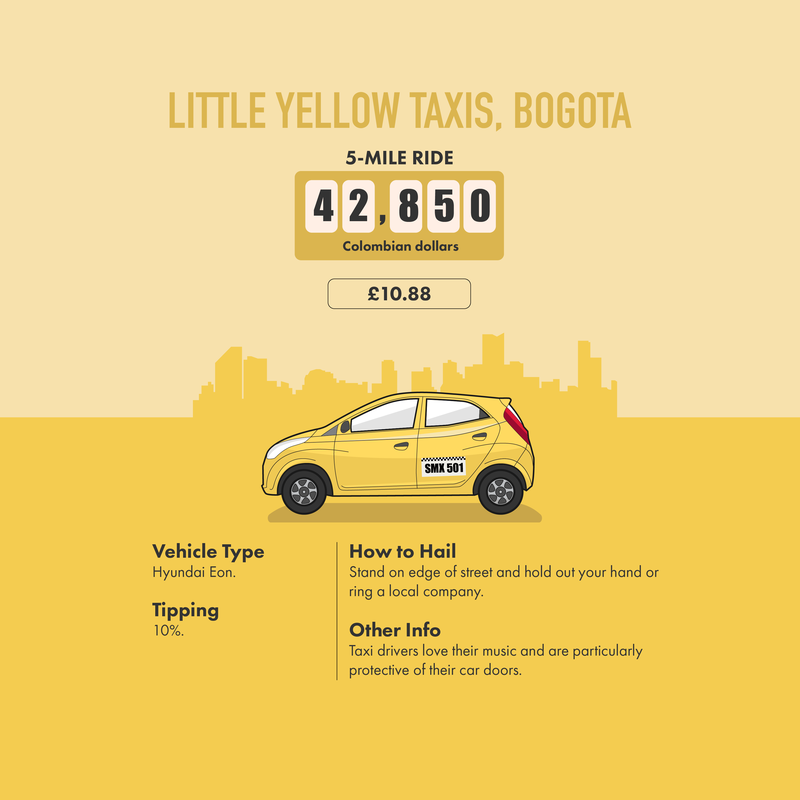 The Little yellow taxis of Colombia can be booked by ringing a local company. Ubers, which originated in San Francisco, can be summoned at the touch of a button through the company’s mobile app. One of the biggest differences between countries when it comes to taxis is the process of agreeing a price. Some taxis, such as London black cabs and Uber cars, have non-negotiable prices as they are set by meter. But you can ask the driver what the cost will be before starting your journey. Other taxis will involve a process of haggling. 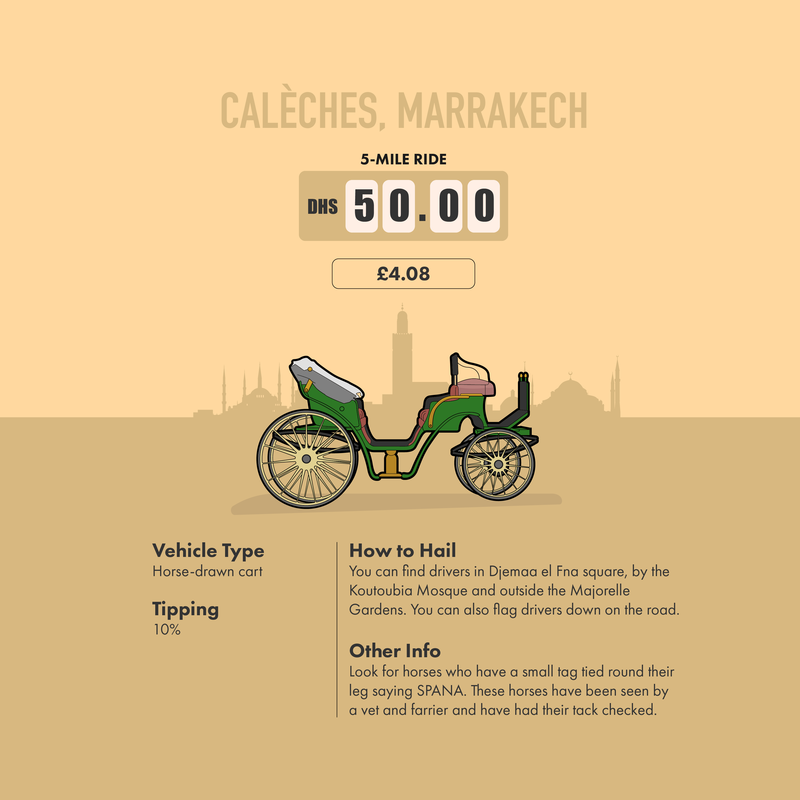 For example, Calèche drivers in Marrakech and tuk-tuk operators in Bangkok will expect you to barter. With taxis like these, agreeing a clear price with the driver before getting in the vehicle is a good shout. It’s best to check whether the price you’re paying is per person, or for the hire of the full vehicle. Some taxi operators do not expect a tip. This is true for the taxi types we looked at in Venice, Cambodia and Bangkok. In other territories, leaving loose change or rounding up to the nearest whole number will be enough to give as a tip. You’ll find this will be welcome in Hong Kong, London and New Delhi (round up to the nearest 10 rupees here). Some places will expect you to leave a tip equal to a percentage of the fare. 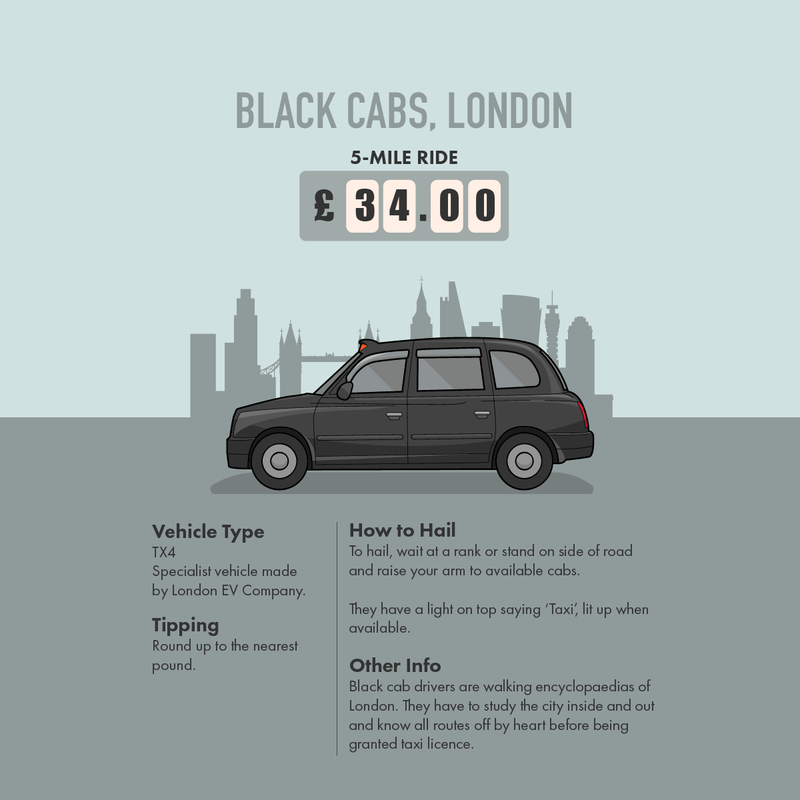 Have a look at our infographics to make sure you don’t make a tipping faux pas.